President Emmanuel Macron (file photo). French President Emmanuel Macron kicks off a 4-day trip to Africa this Monday starting with Djibouti. On Tuesday 12th he will move on to Ethiopia and then to Kenya on Wednesday 13th. The Elysée Palace has stressed the importance of this trip to African countries, namely those with which France does not enjoy traditional ties like it does with former colonies in Francophone Africa. Since the beginning of the Yellow Vest movement protests last November, President Macron has considerably reduced his overseas trips, but he reportedy did not want to cancel this trip to Djibouti, Ethiopia and Kenya. After Ghana in 2017 and Nigeria in 2018, Macron's visit reaches further into "non-Francophone" Africa with Ethiopia and Kenya. Djibouti will be his first stop where he lands on Monday evening, to meet with President Ismail Omar Guelleh. While in the country, Macron will also visit France's largest military contigent based in Africa with its 1,450 troops. Macron will be the second French president to travel to Djibouti in 20 years, after Nicolas Sarkozy in 2010. Djibouti holds a strategic position in the Horn of Africa and hosts a number of foreign military bases including the United States, Japan, Germany, Italy and more recently China, which has established an army support base there. The Elysee Palace says that the Djibouti trip will serve to strengthten ties with a traditional ally and, apart from a defence cooperation treaty signed in 2011, there are a number of economic dossiers to examine. The rapprochement between Ethioipa and Eritrea, along with the increasing influence of China, have re-shuffled cards in the Horn of Africa. And France intends to consolidate, as well as increase, its influence in the region. In September of last year, following a visit to Djibouti, a group of French members of parliament stressed the need to reinforce France's presence in the country. They said Paris needs to focus on three sectors: military, economic and cultural. In an interview to Jeune Afrique magazine in 2015, President Guelleh deplored the absence of France. He said it was as if France had little consideration for the country, adding: "there has been little investment and no ministerial visit in years." Macron's visit, despite being a short one of only some 15 hours, aims to dispel this prevailing sentiment in Djibouti. 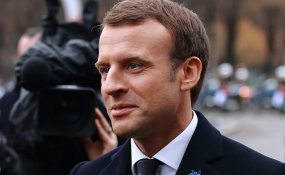 On Tuesday 12th, President Macron is expected to be in Ethiopia in the afternoon and then travel to Lalibela with Prime minister Abiy Ahmed. Lalibela was declared a UNESCO World Heritage site in 1978. The site consists of 11 cave churches, constructed around the 13th century, carved into the rock of the Ethiopian Highlands. Lalibela is the largest Ethiopian cave site and also the most complex, with overlapping churches, underground galleries and open trenches, passageways and rooms carved into the rock. The churches are only reachabe by staircases and tunnels. Giant protective roofs supported by metal structures have been erected in 2008 to protect the churches, but they raise concern among Ethiopians who find them ugly and fear that they might collapse. During Prime minister's Ahmed visit to France last year, President Macron declared that France will contribute to the renovation and restoration of the Lalibela site. Macron is also expected to meet Ethiopia's President Sahle Work Zewde, appointed to that position last year by the cabinet. The career diplomat studied in the southern city of Montpellier and was Ethiopia's ambassador to France between 2002 and 2006. President Macron will travel with eight French business leaders as this visit also aims to facilitate economic partnership with Addis Ababa. Defence and security cooperation will also be tabled. Before leaving for Kenya on Wednesday 13th, President Macron is due to meet the chairperson of the African Union Commission, Moussa Faki Mahamat. As the last leg of this Africa tour ends in Kenya, it will be the first time a French president has visited the country. Along with Kenya's President Uhuru Kenyatta, President Macron will chair the One Planet Summit this Thursday. Upon arrival on Wednesday, the two presidents are due to go to Nairobi's central railway station, where France intends to work on a rapid train service. Kenya's Foreign Affairs ministry described current relations between the two countries having reached an "all-time high". The French delegation of ministers and businessmen are also to conduct "discussions on bilateral matters, including trade, manufacturing, infrastructure support, and peace and security." Two political meetings will reportedly take place on the sidelines of the One Planet Summit, with two recently elected Presidents. Talks are expected between President Macron and President Etienne Tshisekedi of the Democratic Republic of Congo and Malagasy President Andry Rajoelina. Macron is then due to end this Africa tour with a meeting with students at the University of Nairobi, the sort of interaction the French president enjoyed during the Great Debates here in France, an open, public dialogue that was established to tackle the concerns of the French people on issues that have been raised by the Yellow Vest protest movement.